There’s no denying that the origin of this hearty egg entrée is in the Basque region of France, which borders Spain. Basque cooking is known for its extensive use of peppers, onions, garlic, and tomatoes, as well as its excellent air-cured country ham, all of which join together in this delicious dish. Heat a large nonstick skillet over medium heat. Warm each slice of prosciutto in the pan until it just begins to curl. Remove and place each slice on a dinner plate. Heat the olive oil in the skillet over medium-high heat. Add the red and green peppers, onion, and garlic. Cook until soft, about 10 to 12 minutes. Season with salt and pepper. Add the tomatoes, cover, and cook over low heat for 10 minutes. Uncover and cook over high heat to evaporate any liquid. Taste and season with salt and pepper. Return heat to low. Beat the eggs together in a mixing bowl. Season lightly with salt. Pour over the hot vegetables in the skillet. Stir to combine. 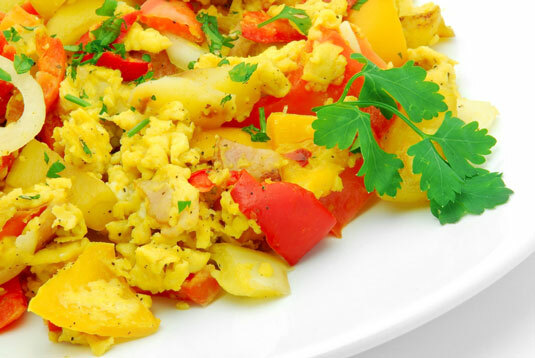 Continue cooking until the eggs set, as if they were scrambled. Spoon the eggs and vegetables over the ham and serve immediately.